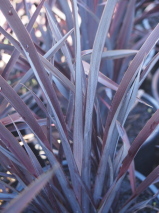 A native flax with deep purplish almost black-bronze colouring. It maintains an upright tidy habit. Hardy to cold and prefers an open sunny site.